Sun, Sand, Surf and Waves. Well, the waves that I am referring here are the Beachy waves effect that you get in your hair when you visit the beach. Moreover, the hair-do that fashion magazines, spot with celebrities or models in their editorial looks, yes, those beautiful hair waves. How to spot the Beachy, in vogue hair trend look, on your own? Without further ado, here are couple of ways we have listed, how you can achieve the look. Layers do best justice to styling the beachy waves in your hair. If you do not have layers, don’t be sad, you can still get those gorgeous waves, just not as quickly as your friends with layered style hair can. Remember those two pig tails, you spotted back in school? You need to bring back those hair styling days. Wet your hair, towel dry them and while they are mildly wet, comb them thoroughly. Thereafter, separate your hair in two sections from the centre, make two braids and leave them on anywhere for minimum six hours to overnight. Alternatively you can also make a single braid.You will wake up to the beautiful wavy effect in your hair. Comb your hair gently with your fingers, to maintain the look. Take few strands of hair and twist them around your finger. Alternatively, you can use thin strips of clothing instead of your hand to twist your hair. Tie the twisted strand in a bun. Follow the same method till you have a bigger bun of many twisted smaller ones. Leave your hair in this way overnight to get the wavy look. If you feel uncomfortable you can keep the bun for a shorter while, but at least six hours minimum time is recommended. Another way to achieve the beachy waves, is using the curlers. Depending on the kind of waves you want to wear, choose your barrels accordingly. Curl your hair around the iron, let it be that way for five to six seconds, release your hair. Repeat the same procedure again. Curling irons give more polished and professional looking curls. To keep the waves for a longer time, use salt spray. It creates natural waves in hair in addition to giving them texture and voluminous look. The only side-effect you need to worry about is that, salt spray can make your hair dry if used excessively. Make sure you use them cautiously. Different techniques work best for different people and hairstyles. Which one should you opt, it’s hard to tell. 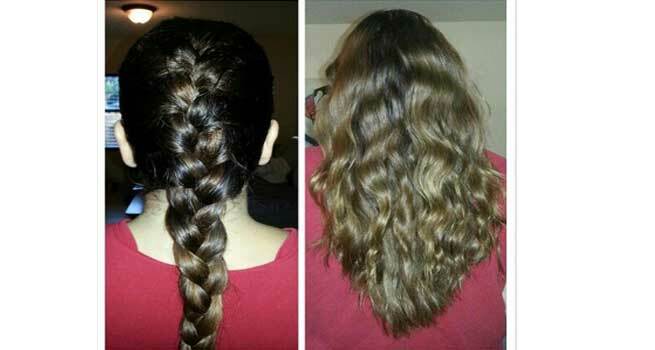 Let us know if you have any other tried and tested method to achieve the beachy wave effect.